I have no idea what to say. 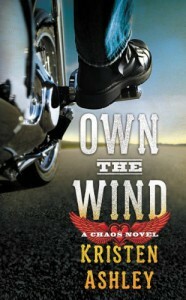 How do you describe the absolute perfection that was Own the Wind? The whole time I was torn between devouring this book and taking my time to savor it. I’m just mind blown. It’s no secret that Tabitha Allen has had an enduring crush on Shy Cage. It’s also no secret that she’s on the wrong path. Partying, drinking and hanging with the wrong crowd, Shy decides its time someone step in and teach her a lesson. He ends up breaking her heart. Now Shy knows what it feels like to be ignored. But then, Tabby suffers through heartbreak again and soon falls into some trouble. She asks for Shy’s help and in the end, she lets him back in, but gets a lot more of Shy than she asked for. In the beginning, I was not impressed with Shy. He was indifferent, f*cked girls left and right, pulled one of the biggest a**hole moves and then excepted to be let back into Tabby’s good graces? Having most of the story in his POV helped him redeem himself in my eyes. I liked knowing that despite his cool exterior, he felt everything Tabby was doing to him. There was a time, he caught sight of her, her eyes would shift away quickly and he knew she was watching him. Anytime she’d been around before he did what he did that night, if he saw her, her eyes were on him. Now he was invisible. It was like he didn’t exist. But when he was let back into her life, he tried his hardest to really make it up to her. That’s when we saw the signature sweet, but 100% KA alpha male come out. And it. Was. Glorious. However, that doesn’t mean he didn’t make some more mistakes. He made plenty. But he recognized his wrongdoings and immediately tried to fix things with Tabby. Tabby was a little different than I thought she was going to be, and I mean that in positive way. In [b:Motorcycle Man|13448656|Motorcycle Man (Dream Man, #4)|Kristen Ashley|http://d.gr-assets.com/books/1337615202s/13448656.jpg|18968802], we got more of the young and stupid side of her, and here we get a look at the more mature and experienced side. Tying into that, I loved all the time jumps. I usually hate them, wanting to keep things in order and not miss out on anything, but it worked in Own the Wind. You got to see how far each of them had come, as a person and as a couple. I also loved how we got more of the rocky side of their relationship than we usually get in one of KA’s books. It was sometimes over serious stuff and sometimes over stupid stuff but in the end, they had to learn how to live together as a couple and know that this was really what they wanted for themselves. We didn’t just get all the sunny skies and rainbows with a microscopic sprinkle of despair; we got everything. Through it all, I never doubted them. They had a beautiful relationship where you knew they weren’t meant to be apart. “Never forgot what we had, still miss it,” Lan shared. Shy tipped his chin down to see the top of Tabby’s head, her profile, her eyes open staring at his throat, her hand at his chest, fingers drifting aimlessly but soothingly, giving him time with his brother but not giving him space, something at the moment he did not need. “That’s your problem, brother, you don’t get that this side is a fuckuva lot more fun,” he returned.